Prepare for an afternoon of incredibly provocative, eclectic art and performance on as Three Rooms Press presents DADA ON THE HUDSON, featuring an array of contemporary dada performance and poetry by leading maverick artists. The event includes the Hudson Valley launch of the internationally-renowned MAINTENANT 10: Journal of Contemporary Dada Writing and Art (2016, Three Rooms Press), featuring more than 150 visual and literary works by artists and writers from around the world, in full color. 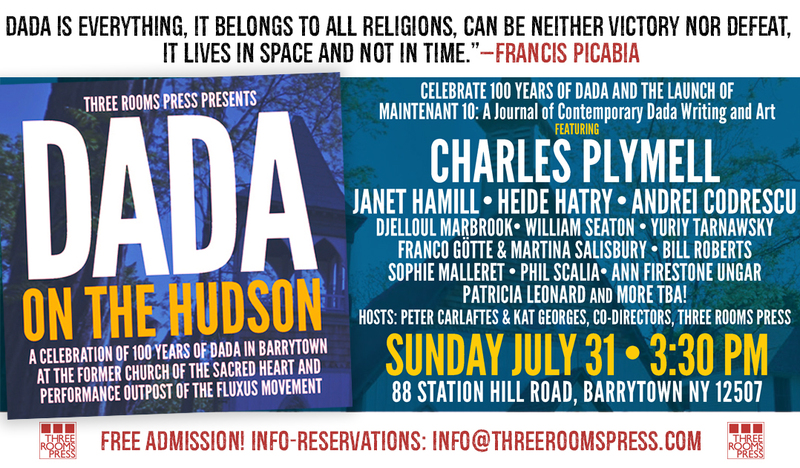 DADA ON THE HUDSON takes place Sunday, July 31, 3:30–6:00 pm at the former Church of the Sacred Heart at 88 Station Hill Road in Barrytown, NY. The church is recognized for its role as a performance outpost of the Fluxus movement. Costumes encouraged. Featured performers include legendary poet and essayist Charles Plymell, surrealist poet and writer Janet Hamill, editor and poet Djelloul Marbrook, provocative neo-conceptual artist Heide Hatry, NPR social commentator and poet Andrei Codrescu, avant-garde poet and New York Group founder Yuriy Tarnawsky, photographer Phil Scalia, dada poetry scholar William Seaton, performance artists Franco Götte and Martina Salisbury, letterpress publisher/poet Bill Roberts, and performance poets Sophie Malleret, Ann Firestone Ungar, and Patricia Leonard. Three Rooms Press co-directors Peter Carlaftes and Kat Georges will host the event. Admission is free. Costumes are recommended: come as you aren’t. For additional information and reservations, please email info@threeroomspress.com. Maintenant 10: A Journal of Contemporary DaDa Writing and Art (Three Rooms Press, 2016) is the most recent installment of an annual series published since 2005. The current issue features work by Andrei Cordrescu, Jerome Rothenberg, Anne Waldman, Charles Plymell, Mike Watt, Grant Hart, A.D. Winans, Mark Kostabi, Raymond Pettibon, John M. Bennett, S.A. Griffin, Claude Pelieu, Mary Beach, Jean-Jacques Lebel, Joel Hubaut, Philip Meersman, Renaat Ramon, Patrice Lerochereuil and many more. Copies will be available for purchase at the event. Three Rooms Press is a fiercely independent New York-based publisher inspired by dada, punk and passion. Founded in 1993, it serves as a leading independent publisher of cut-the-edge creative, including fiction, memoir, poetry translations, drama and art. In addition, Three Rooms Press produces and promotes a variety of literary and cultural events in New York, London, Paris, Berlin, Brussels, Los Angeles, San Francisco, and more, including readings, plays, workshops and concerts. Three Rooms Press books are distributed in the U.S. and internationally by PGW.